Elephant has quite possibly the best trailer I’ve ever seen. Subtle, it gives away very little yet is positively dripping with malice. More importantly, Elephant is also a equally powerful film. Based unofficially on events such as the Columbine high school shootings, the film follows students around the school in a non-linear fashion. As the school day unfolds, the tension builds and builds until the horrific climax that we all know is coming. All the actors are fantastic. 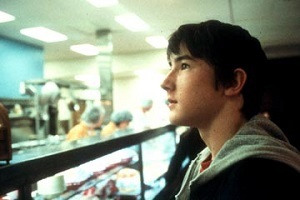 They look a bit like movie stars, but Gus Van Sant obviously wasn’t opting for the reality of Bully or Thirteen. The cinematography is excellent – there are some very long shots, and obviously one hell of a good steadycam operator. Occasionally the camera is so in the face that the actors slip and glance at the camera, but with such a shooting technique this would have been almost impossible to avoid. The film in no way explores the issue of the shootings – it doesn’t attempt to answer any of the questions we find ourselves asking when we hear of such tragedies. This story is simply a day in the life. Van Sant has had a patchy career – I couldn’t stand My Own Private Idaho (no matter how brilliant everyone said it was), Good Will Hunting was um, good… but then he made the same film again with Finding Forrester. And what the hell was going on with the shot-for-shot Psycho remake??? Elephant is an incredibly powerful cinematic experience. I was literally on the edge of my seat for the last half hour.